2. What is Pressure Cooking? Pressure cookers were used during our grandmother’s days for canning garden grown vegetables, berries from the bushes, and fruit from the trees for use over the winter when nothing was growing. Meat was also canned from farm raised cows, pigs, poultry, and rabbits. The cookers were very popular for cooking dinners in a quick amount of time. Everything old becomes new again it seems with better features and functions. During grandma’s days, electric and digital pressure cookers did not exist—they were all used on the cook stove, usually gas. They were made of aluminum, and today we find many materials for the manufacture of the best pressure cookers. They were safe then, and they are safe now when you follow the manufacturer’s instructions precisely. For the very interesting history of pressure cooking, read the Wikipedia site here. Before pressure cookers, the pioneers would salt and dry their meat from animals killed in the forests and woods. Their methods were salting, smoking, drying, and canning. The small animals they raised, such as poultry, could be killed and cooked as they needed it for dinner that day. They learned to can their vegetables and fruits in water canner baths. The water bath was never used, and cannot be used today, for nonacid foods. It is a simple method of putting glass jars in boiling water and covering with a lid for a specific amount of minutes, usually a half hour or less. Before glass jars, the pioneer women dried their fruits and vegetables. Notice again, what was once old is now new. The supermarkets supply us with dried fruit and nuts today. The people then ate heavy hearty meals and never put on weight because they were always working in the fields, gardens, and homes. They had no time to sit and put on weight. Pressure cooking is a precise method for cooking food with broth, water, or other bases such as tomato juice. The container cooks faster holding in all the vital vitamins, minerals, and other nutrients. The container cooks much faster than a typical saucepan or skillet. The steam confined to the inside of the cooker lets the temperature inside increase. When your food is cooked, the pressure is released slowly permitting the lid to be safely opened under no pressure. This is the method for canning or for dinners. 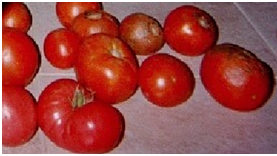 Pressure-canning at a temperature of 240-degrees F. at 10 pounds of pressure at sea level is the only method recommended for nonacid vegetables, fruits, and meats. You can find detailed instructions with your pressure-canner and at websites today. The boiling-water bath is used only for acid fruits and brined or pickled vegetables. Details for this process will be found when you purchase a water-bath canner. Pressure cooking is a fast way to cook a 6-pound chuck roast with potatoes, celery, onions, and carrots for dinner, rather that long baking, braising, or simmering all day. No matter how high the heat, boiling in water in the presence of air can never produce a temperature over 212-degrees F. In pressure cookers, you can cook as high as 250-degrees F. kept at 15-pounds pressure on the gauge and that takes only about one-third of the time. 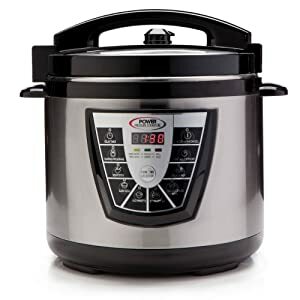 Many of the reviews here will discuss the best electric pressure cookers that are programmable, and digital with many features such as browning, steaming only, time delays, and warming functions. With pressure cooking, foods cook faster saving energy. These cookers use less liquid than boiling in a Dutch oven. Dinner is served sooner keeping all the nutrients for what’s in the pot. Some models have a steamer basket for cooking more foods together. You can cook your meat first for a longer time, cool to reduce pressure, then add vegetables and noodles later so they will not be overcooked mush. Micro-organisms are killed by the extreme heat of the steam where the boiling point of water might not because it’s not hot enough. 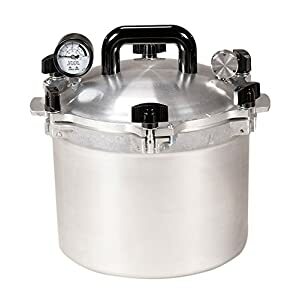 A pressure cooker can also be used to sterilize food jars for canning, and baby bottles of glass (never use plastic bottles for babies). Most pressure cookers can be used at high altitudes for dinner or canning. Flavors are better at higher cooking temperatures needing less seasoning. Pressure cookers can cost more than a single cooking pot, but are well worth it. Most cannot be put in the dishwasher, and you never want the rubber gasket sealing ring in the lid to touch sharp knives or forks. It is delicate for keeping the steam in when cooking. Remember to clean by hand the particles of food around the gasket. It is easy to do with an old toothbrush, toothpick, or cotton swab, but never sharp instruments. If the gasket splits or tears, replace it. If you live in a dry climate, or the dry air from your furnace has it drying out, a bit of cooking oil will help, but is not long lasting. Without a good seal, the pressure cooker will not work. Each manufacturer has the replacement gasket and your User’s Manual will discuss this. Precise timing is not achieved when you open the lid to add or check the food. You might want to use a timer. A pressure cooker is heavier than regular pots and pans, and about as heavy as a cast iron skillet. You will need to add more liquid for a longer cooking time. Your manual will explain the food variabilities and recipe books discuss this as well. The All American® model 915 pressure cooker not only lets the home canner use it for produce, but it can also be used for big batches of stew or other large recipes for crowd pleasing tender cuisine. It is also available in 10.5-, 21.5-, 25-, 30-, and 41.5-quart sizes for the serious canner. The 15.5-quart unit holds 10 pint jars or 7 quart jars of traditional round regular-mouth Mason jars or your grandmother’s Ball or Kerr jars. You cannot use 5 half-gallon jars. They are too tall for the canner height. Remember, pints and quarts have different processing times. 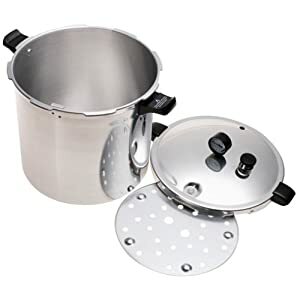 Made from extra sturdy, durable, and heavy-duty cast aluminum, the canner will give you the even fast heat you need when canning. The top center handle is cool to touch newly designed and made of Bakelite, a generic named early plastic type made of phenol formaldehyde resin. The canner is easy to clean having a satin smooth finish inside and out. With the double thick top edges, you are assured of more protection at heavier wear areas with its precision machined metal-to-metal sealing method. There are no rubber gaskets to crack, split, or needing replacement. The lid is easy to put on and remove with the easy-to-maneuver clamping wing nuts. You will have 2 automatic venting functions of the safety control valve and overpressure plug for added safety. The geared steam gauge weight pressure regulator is 5, 10, and 15 psi (pounds per square inch) pressure. Use only on gas, propane, or electric stoves with coiled calrods. Do not use on glass, ceramic, induction, or flat top ranges. The canner is aluminum so cannot have a magnet for induction stove tops. 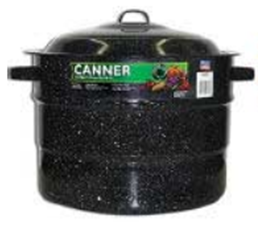 The inside diameter of the canner is 12-5/8-inches, the inside height is 7-1/2-inches, the overall length is 15-1/2 with the overall height of 12-1/2-inches and it weighs 18-pounds. Gift-wrapping is available for holidays, birthdays, and special occasions. You will receive a User’s Manual, canning jar rack, recipes, specifications, and a 1-year Limited Warranty. This pressure cooker and canner is not intended for commercial use. The All American® canner is made in Wisconsin, USA, since 1930. The canner only ships in the USA. 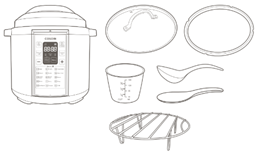 The PRESTO® model number 01781 pressure cooker and canner is an excellent canner. PRESTO® has been making these since 1905 in Wisconsin, USA. This pressure canning method is the only way to safely can vegetables, fruits, meat, poultry, and seafood says the U.S. Department of Agriculture. This canner also can be used as a boiling-water canner for jams, jellies, preserves, pickles, and salsa. For a large gathering of people, use it as a pressure cooker to have your foods and tamales cook quickly. The cooker canner holds 7 quarts and 7 pints of Mason jars with regular mouth. 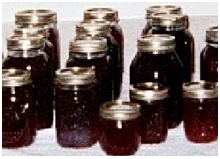 One less jar will be processed each time using wide-mouth jars. It will never warp made of heavy-gauge aluminum for great even heat. It will work on gas, electric, and smooth top stoves. It has a cooking rack for the bottom so the jars are not directly in contact with the stove’s heat providing water circulation to the jar bottoms. It and most all other pressure cookers cook at sea level and high altitudes. The pressure hands dial-type gauge displays the complete range of pressure for processing food. The overpressure plug allows you to release steam pressure build-up along with the pop-up pressure gauge that gives a correct read out. You will be able to keep your exact pressure with these devices on the lid. The lid’s air vent and locks let the internal pressure build when the lid is tightly shut. With the gasket, it keeps steam pressure in with even more tension. The locks keep the lid from releasing until you reduce pressure for safe opening. Always have safety in mind with all pressure cookers. The pressure is from 5- to 15-pounds. Clean by soaking with soda or vinegar or detergent overnight never using abrasive cleansers such as scouring powders or steel wool soap pads. A metal polish that is smooth will help keep the shine and silky finish inside and out. Do not submerse the lid in water and always remove the gasket to remove food stuck on. Keep the vent tube free of liquid and bits of food with a pipe cleaner or tooth pick. The vent, overpressure plug, and cover lock are removable for cleaning. Be sure to read the manufacturer’s instructions for safe handling of the dial gauge that is fragile. The dimensions are 14-inches diameter (17-inches with handles), and 15-inches tall with the lid on. The liquid capacity is 23 quarts and the cooker weighs 12 pounds. 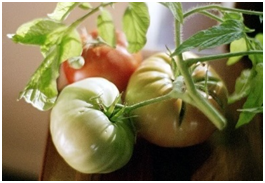 Read about canning basics at the PRESTO® website here. You will find tips and stovetops recommended by PRESTO®. Beginners and experienced canners will like this site. Gift-wrapping is available for holidays, birthdays, and special occasions. You will receive a User’s Manual and a 12-year Extended Warranty, a 76-page instruction book with 50 recipes. The PRESTO® canner is designed and engineered in the USA and made in China. The canner only ships in the USA. 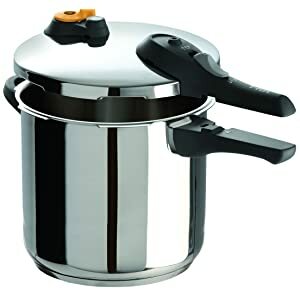 The T-fal® model number P25144 stainless steel pressure cooker is made of 18/10 stainless steel and is PTFE (polytetrafluoroethylene), PFOA (Perfluorooctanoic), lead- and cadmium-free. It works with all stoves including induction. Enjoy using the cooker for large amounts of chili and stew with gatherings of people too. This unit is not a canner. There is no Teflon lining inside. PTFE, a component in Teflon®, has been around since the 1940s. DuPont™ makes Teflon®, in use since the 1960s. The plastic does not burn, is strong, tough, and waxy, and has been debated in recent years for its safety. It is not used in this cooker. The shiny and durable stainless steel bottom can be put in the dishwasher without the lid. For increased safety, the steam release petcock valve will control the release of steam. If you wash the lid and gasket in the dishwasher, it voids that part of the Warranty. There is no rack with this unit. The silicone gasket should be replaced each year depending on how much you use the cooker and if there are any cracks in it. The replacement gasket part number for ordering on Amazon.com® is X9010103. Use the T-fal® pressure cooker for large dinners for many guests. The pressure valve lets you cook at 10 or 15 psi. It has a safety valve, pressure indicator, and the lid has a push button on the handle to close safely. The tough Bakelite handles are riveted for a safe grip. The pressure cooker will not open when it’s in use and under pressure for your safety. Steam escaping will make a hissing sound and that’s normal. Read all about that in your instructions. Do not pressure fry anything ever in a pressure cooker. The dimensions are 11.5- x 18.06- x 12.48-inches with lid weighing about 10 pounds. Gift-wrapping is available for holidays, birthdays, and special occasions. You will receive a User’s Manual in English and Spanish and a 10-year Limited Warranty outlined in the User’s Manual. The T-fal® pressure cooker is made in China. The Prestige® Smart Kitchen model number PRDA10 is a wonderful large cooking appliance addition for large family homes and get togethers. The Alpha base with magnet can be used on electric, gas, propane, and induction cook tops making it a great induction pressure cooker. Check the instructions for glass topped stoves. The 18/20 stainless steel offers even heat distribution and the cooker has cool-to-the-touch bolted on handles that are easy to hold with a helper handle on the front. The heaviest and most durable cookers, for example, are 18/10 stainless steel. This means it has 18% chromium and 10% nickel and will last longer. Chromium will protect the stainless steel from rust and stains and with more chrome, your pots will look very shiny. The larger the numbers, the more the cookware is corrosion resistant. Stainless steel of 18/20 means it has 18% chromium and 20% nickel, which is this cooker. The pressure indicator shows you when you can safely remove the lid. With its controlled rubber gasket release method, you have additional safety when it releases extra steam in the cooker and it whistles to warn you. 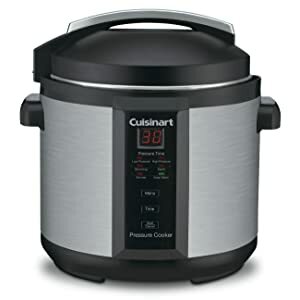 This pressure cooker is not recommended for home food canning canning because there is no way of knowing its psi, no gauge, and no steady jiggle releasing excess steam pressure. It is great for cooking meat, vegetables, rice, beans, and fruits. The dimensions are 15-inches tall x 11-inches in diameter and it weighs about 8 pounds. Gift-wrapping is available for holidays, birthdays, and special occasions. You will receive a User’s Manual and a 10-year Limited Warranty outlined in the User’s Manual. 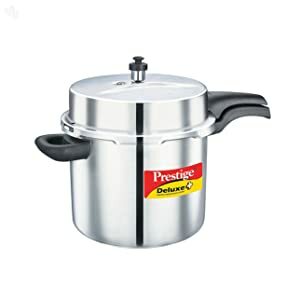 The Prestige® cooker is made in India. The Sunbeam® pressure cooker model number 72910-02 is made by Gibson Overseas®, Inc. The unit is a pressure cooker only and not a home canner. There are no ways for knowing its psi, no gauge, and no steady jiggle releasing excess steam pressure on this cooker. The lid is made of 2.4 mm aluminum with 1.5 mm for the body and 2.9 mm for the bottom base. The long Bakelite handle is of 2 sections for properly attaching the lid to the pot bottom securely. The handles are welded on. This mirror finish pressure cooker is fast and quick for cooking brisket and less tender meats. Add vegetables, and you have a delicious one-pot meal. Pressure tenderizes inexpensive cuts of meat such as pork and beef with better flavor than baking or pots boiling on the stove top. Vitamins, minerals, and nutrients are preserved using a pressure cooker. You can cook 3 to 10 times faster with a pressure cooker and much faster than a microwave stuffed with a roast. Aluminum does not come out nice when put in the dishwasher. The gasket and lid cannot go in the dishwasher at all. The bottom only is oven-safe to 350-degrees F.
The dimensions are 15.9-inches tall x 9.6-inches in diameter weighing about 5.2 pounds. Gift-wrapping is available for holidays, birthdays, and special occasions. You will receive a User’s Manual and a 5-year Limited Warranty. The Sunbeam® pressure cooker is made in China. 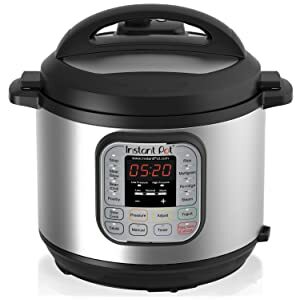 The Instant Pot® best electric pressure cooker model number IP-DUO60 has plenty of power at 1000-Watts and is designed by Canadians. The 18/8 stainless steel cooker is durable with many functions digitally controlled, and the outside is brushed for a nice sheen and no finger prints. The bottom of the pot where the electronics are housed is made of 3-ply thick 304 stainless steel food grade. This cooker is a top best seller on Amazon.com®. The 304-grade stainless steel is made up of no more than 0.8% carbon and at least 50% iron. The chromium binds oxygen to the surface of the product to protect the iron from oxidation (rust). Nickel also enhances the corrosion resistance of stainless steel and makes it shiny. Consequently, the higher the nickel content, the more resistant the stainless steel is to corrosion. 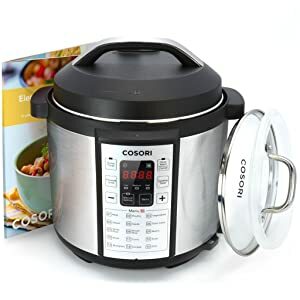 It is a convenient and versatile 7-in-1 cooker being a pressure cooker, slow cooker, rice cooker, hot cereal maker, steamer, yogurt maker, will sauté and brown, and can be used as a warmer. The programmable control panel on the front has 14 settings to have it your way for soups, meats, stews, beans, chili, poultry, pork, beef, and other settings. You can also pasteurize and ferment rice (Jiu Niang). 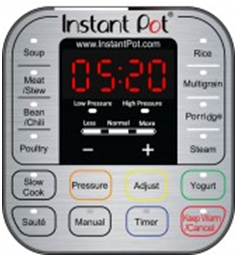 With the 2 pressure settings, you will have your cooking time decreased by 70%. The low pressure lets you cook vegetables for instance without them becoming mushy. For you yogurt lovers, you can heat the milk for fermentation in either the pot or jars with up to 5.2 quarts (5 liters) of milk. Then add the fruit and nuts you enjoy. The cooker has 3 sauté and slow cooking temperatures and you can choose the time from a half-hour up to 20 hours. Additionally, you can delay your cooking to start up to 24 hours. If you want to manually set the timer it can be set for 120 minutes with the automatic keep-warm mode up to 10 hours. It can be set manually up to 99 hours. 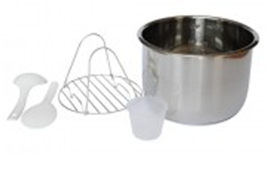 The stainless steel rack has handles for easy lowering and lifting food in and out of the pot for tall asparagus, a rice paddle, soup spoon, measuring cup, and condensation collector. The User’s Manual and instructions are in English, Spanish, French and Chinese with cooking time tables. Plug the UL and ULC certified listed cord into a USA 110/120-Volt, 50/60 Hz outlet. The power is 1000-Watts. Outside the USA you would need to buy an adapter for 220/240-Volts. Instant Pot IP-DUO has 2 pressure settings of high 10.2 through 11.6 psi (70 – 80 kPa) and low of 5.8 through 7.2 psi (40 – 50 kPa). The dimensions for the inner part are 8.66-inches tall x 6.3-inches in diameter. The outside dimensions are 13-inches tall x 12.6-inches in diameter and weighs about 14 pounds. Gift-wrapping is available for holidays, birthdays, and special occasions. You will receive a User’s Manual and a 1-year Limited Warranty. The Instant Pot® pressure cooker is made in China. The steam pressure increases cooking temperatures inside. Your food is more nutritious and flavorful than the customary way of cooking or baking. 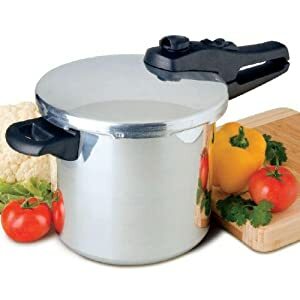 You will have no mess and dirty pots using this one-pot method for your stew, soups, meat, and desserts. This unit is not designed for making yogurt. The pressure cooker does not have a home canning mode. You will receive a recipe book, measuring cup, spoon, and ladle that comes with the pot along with a stainless steel rimed glass lid and extra sealing ring. 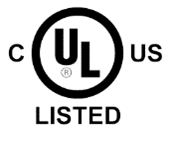 Plug the UL certified listed cord into a USA 110/120-Volt, 50/60 Hz outlet. The power is 1000-Watts. Outside the USA you would need to buy an adapter for 220/240-Volts. The Cuisinart® model number CPC-600 is made of stainless steel and operates at 1000-Watts of electricity. The interior is non-stick and BPA (bisphenol)-free for safety. The side handles are cool to touch, it is dishwasher safe for the cooker and trivet included. With the LED digital control panel, you can set it to run at 99 minutes from 0-40 minutes in 1-minute increments. The outside will not show fingerprints with its brushed stainless steel finish. It will brown, simmer, sauté, and keep food warm with the programmed settings. You can select from low or high pressure from the push button controls. The low is 6 and high is 10 psi. You cannot can food in jars with this unit. It has a condensation collector and makes wonderful rice. The dimensions are 12.20- x 12.20- x 13.19-inches and it weighs about 12 pounds. Plug the non-hard-wired UL certified listed cord into a USA 110/120-Volt, 50/60 Hz outlet. The power is 1000-Watts. Outside the USA you would need to buy an adapter for 220/240-Volts. Gift-wrapping is available for holidays, birthdays, and special occasions. You will receive a User’s Manual and a 3-year Limited Warranty. The Cuisinart® pressure cooker is made in China. 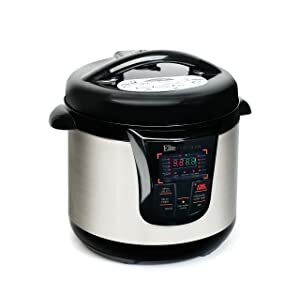 The Elite platinum 1200-Watt electric pressure cooker model number EPC-808 is brushed stainless steel exterior with Bakelite cool handles and a LED digital control panel for cooking with pressure. The instruction manual states you can use this cooker to preserve food in jars as a canner. The removable 8-inch inside liner is non-stick for easy cleaning. The fun colors will harmonize with your kitchen décor in black, blue, orange, purple, red, turquoise, and white. The small slot is for holding the spoon you receive with the cooker. It has 13 programmable functions with a 24-hour preset time. The unit is quiet and resets itself if power goes out. Set it from 0 to 99 minutes for a custom meal. The 13 programs are reheating, cooking beans, natural brown rice, white rice, grains, stew, poultry, pork, fish, beef, ribs, vegetables, potatoes, fruits, and desserts. At the end of the cooking time, it will beep so you know your dinner is ready. It has a seal ring and you can brown your meat then continue cooking in one pot. You cannot make yogurt with this unit. The lid is hinged and the lock lets you completely remove it. The condensation cup goes to the rear at the top. This cooker does not have a low-pressure choice. It is rated as a 12 psi cooker by the manufacturer. The working pressure is 0 – 10.2 psi (0-70 kPa); and the psi is 12 (82.74 kPa). The maximum pressure is 13.1 psi (90 kPa). You can read more about this in your manual. The dimensions are 12- x 12- x 12-inches and including the handles it is 14- x 14- x 14-inches. It weighs 15 pounds. The pot measures 7-inches deep and 9.25-inches across. Plug the non-hard-wired UL listed cord into a USA 110/120-Volt, 50/60 Hz outlet. The power is 1200-Watts. Outside the USA you would need to buy an adapter for 220/240-Volts. Gift-wrapping is available for holidays, birthdays, and special occasions. You will receive a measuring cup, User’s Manual, and a 1-year Limited Warranty. The Elite by Maxi Matic pressure cooker is made in China. The Power Pressure Cooker XL™ model number PPC770 lets you can fresh produce and cook dinners saving you 70% energy using 1000-Watts with electric digital control features. The pot is made of brushed aluminum showing no finger prints. It is available in trim colors of black, green, blue, and red. The inner pot sleeve is made of a non-stick honeycomb aluminum liner and is dishwasher safe. Do not put the lid or outside bottom housing in the dishwasher. You will cook 10 times faster with this pressure cooker than you would by conventional methods. It has a large glass lid handle and will automatically keep all your dinners warm when you select that mode on the control panel. For canning, the 6-quart pot will hold 4 glass wide-mouth pint jars. This cooker is also available in an 8-quart size. The cooker comes with a flat bottom rack to sit your jars on. The manual states all presets use a pressure of 7.2 psi except the canning function that uses 12 psi. This pot is not recommended to use above 2000-feet altitude. The dimensions are 12 x 14-inches and weighs 9 pounds. Plug the UL listed cord into a USA 110/120-Volt, 50/60 Hz outlet. The power is 1000-Watts and draws 8.3-Amps. Outside the USA you would need to buy an adapter for 220/240-Volts. Gift-wrapping is available for holidays, birthdays, and special occasions. You will receive a cookbook, canning book, steamer tray, condensation cup, ladle, and canning rack, User’s Manual, and a 1-year Limited Warranty. The Power Pressure Cooker XL™ pressure cooker is made in China. Safety is the most important thing to consider using canning pressure cookers or the smaller meal pressure cookers. Never assume you know how to use this device. It is of major importance to read the manufacturer’s User’s Manual. Always read the instructions carefully. Keep your instruction booklet with you at all times when cooking. It is not a good idea to buy a used pressure cooker at yard sales—a User’s Manual has usually been lost years ago. Use extreme care when you put the lid on the canner. Cover the jars with 1-inch of water when canning at a rolling boil. 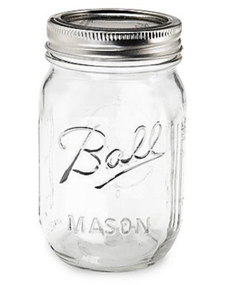 Use only recommended glass canning Mason jars such as Ball®. The most important parts are the rubber gasket seal and the steam vent tube on top of a pressure cooker. Be sure the gasket is clean, not splitting, and sitting tightly. The vent tube must be free from debris, dust, and lint. Most manufacturers include a tube cleaning device. Pipe cleaners are handy for cleaning the steam vent (petcock) tube. Never walk away from your pressure cooking while it is on the stove cooking. Keep kids and pets away. Carefully let off the steam as instructed in your Manual. Be very careful doing this because steam can cause serious burns. Do this will short bursts, not one long release on the button or liquids can come out. This method is similar to a food processor pulse function. When the steam has been released fully, you can remove the lid. Never force the lid to open. I like beans and ham hocks made in a pressure cooker and I’ve done this tasty dish for years having cornbread to go with it. Apples will foam up when you make homemade applesauce. Fill the cooker only one-third full with foaming foods. Your User’s Manual will discuss this. When you fill the pressure cooker too full, the foaming particles can clog the steam vent tube. Add a tablespoon of butter or oil to decrease the foaming. This is good to do when you make homemade jams and jellies in a regular pot to cook and then add sugar and pectin. Foam producing foods are split peas, any variety of dried beans, oats, cranberries, apples, and barley. A whole pot of dandelion greens or other vegetables will foam from their enzymes. Simply fill a pot of green beans only one-third full. Anything raw will foam from enzymes. Inexpensive meats such as corned beef, brisket, and chuck come out very tender with a short amount of time than cooking the conventional way. In a crockpot, it would take 8 to 10 hours, in a pressure cooker only about an hour. Check your manual and recipes. Never use your digital pressure cooker as a deep fryer filling it full of cooking fat! Always have the correct amount of liquid to produce steam. Watch the pressure indicator always. Do not walk away from a pressure cooker. Brown your meat in your pressure cooker, put on the lid and let it cook. The newer cookers have this function, but this can still be done with an older model. Each recipe has its own cooling method. The older ones use cold water while you press the release with a knife. You can also let the cooker cool naturally if you are not in a hurry for up to 30 minutes usually. Do not sit the pressure cooker in a sink of cold water. Never ever store your pressure cooker with the lid on. Keep the lid separate from the bottom. Do not put the rubber gasket in the bottom. Do not twist the gasket; have it keep its natural shape. I store mine in a brown paper bag and let it lie flat. Plastic bags and containers create condensation and that’s not a good thing. Dry is best. Never ever deep fry anything with an aluminum or stainless steel pressure cooker. There’s a difference between a pressure cooker and a pressure fryer. You will enjoy your pressure cooker or combination canner and have years of delicious food sitting on a shelf in glass jars. Be sure to read customer reviews to learn of the experiences buyers have had with the products reviewed here. Foods taste better, meat is fork tender, and all vitamins and minerals are kept in the cooker. Enjoy your product and be sure to read the User’s Manual full of helpful safety precautions that must be met. I’ve used the Fissler at least weekly (or more often) for over 5 years now. It works beautifully, washes easily and reduces cooking time plus kitchen heat. It is a great soup pot. Boiled eggs (even farm fresh) in a pressure cooker peel with ease. The Fissler is made in Germany and a very good pressure cooker and a bit more costly. Thanks for sharing your love of this pressure cooker. I’ll bet it makes tender corned beef in no time compared to hours on the stove cooktop or in the oven.